"Naming your baby should be as much fun as making it. Well, at least as much fun as you can have with your iPhone." This is the tag line to the BabyBinks' iPhone application Stork Drop. After 2 months in the App Store priced at $2.99, we decided to conduct an experiment to see if we were leaving 'money on the table' with our pricing strategy. Currently, there are currently 53 applications returned when using "Baby Names" as the search query in the iTunes App Store. There is about a 50/50 split for free/paid applications, with only a few Lite versions of paid apps. In these cases, the Lite versions consistently rank significantly above the Paid versions. The overall quality of the apps vary significantly. While I am biased, since my app is in this category, I would say only about 5 apps are well-designed and thought out attempts at creating a quality product. The others are simply table views of data with some sort of baby image on the front page. Given that all these apps (including mine) use the same data source (publicly available U.S. Social Security data), the presentation of the data is the only thing that allows the apps to differentiate themselves. Interestingly, there are many apps that appear from the query "Baby Names" that don't have any baby naming functionality. These include: Baby Tracker: Nursing, Pet Names Plus, Toddler Flashcards, etc. This problem speaks more to some highly-discussed problems with the App Store indexing and the new keywords in iTunes Connect. I'll leave that for another day. Stork Drop has enjoyed moderate success in the App Store. It has been consistently in the top 5 paid apps in the "Baby Names" category and typically floats around position 15 for all baby naming apps. 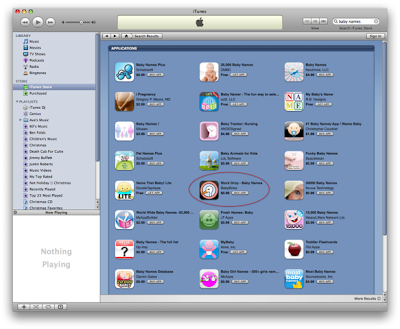 Stork Drop is circled in the App Store search below. Monetarily, the word 'moderate' is extremely generous. I would put it in the beer money (or more appropriately baby formula) range. From a feature set position, Stork Drop stands out as one of the only applications that provides any real interactivity or utilizes the iPhone as more than just for statics data display. 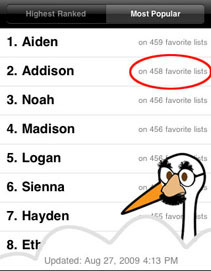 For example, Stork Drop provides real-time statistics of name popularity by monitoring all users "Favorite Baby Names" lists through an external server (screenshot of this "Snoop" feature is shown). I would concede that some of the other apps have better graphics, but then again, every app (including Stork Drop) is based off a series of UITableViews. We believe that our app has some premium features and made the decision to price it at $2.99. This put us at the high end (only 1 app is more expensive) in our category, but we (like every developer) felt that it is worth it. Each week, we have run a sale dropping the price to $0.99 for Happy Hour or to celebrate Father's Day. We always notice a slight increase in downloads, but nothing to convince us that dropping to the $0.99 price tier permanently would be worth it. Basically, we would need to sell 4x as many apps at $0.99 to be more profitable that $2.99. We did not see this consistently during our $0.99 sale days. As I lay awake at night (or as I'm rocking the baby to sleep), I often wonder if we should be in the 'race to the bottom'. Maybe, if we dropped to $0.99, visibility would increase, which would increase sales, which would increase our ranking, which would increase sales, which would expedite my retirement....then both me and the baby wake up in a cold sweat. Enough wondering, it was time for action. For one full week, we dropped the price to $0.99 to see what would happen. For full disclosure, I did update my app description to state that Stork Drop was "on sale" for the week. In addition to the price drop, I also took a solemn vow to not check my daily download statistics. This was mostly so that I wouldn't chicken out half way through the week. After all, I had grown quite accustom to that formula money rolling in. On the 8th day, I downloaded my stats and...it was pretty disappointing. Stork Drop only averaged 2.1x the number of downloads at $0.99 than it did at $2.99. I would have needed to average 3x the downloads to break even. My ranking in the category floated quite significantly during the week. On one day, Stork Drop ranked 6th in the category, but mostly hovered around 12, just slightly better than my usual 15. Either way, I never hit the Top 4, which is search gold in iTunes, as a search result shows the first 4 apps on the main search screen. Interestingly, a few hours after the price drop was reindexed by iTunes, my ranking fell to 38th. It stayed this low for approximately 20 hours. This makes me wonder if the iTunes popularity algorithm is designed to discourage $0.99 app. Or maybe is it punishing volatile pricing strategies from developers trying to game the system. Of course, I wasn't trying to game the system...I was simply doing a marketing experiment. This might be the basis of another experiment for a future day. It wasn't obvious at first, but something did change significantly. Unfortunately, it was for the worse. Before the experiment, Stork Drop had a solid ★★★★★ star rating with no rating below ★★★. After the experiment, the average rating was ★★★ stars with several, ★ and ★★ star ratings. This was surprising, as I would have believed that users would have been pleasantly surprised by the value of the app compared to what else was out there for $0.99 (in the Baby Name category). Instead, the $0.99 purchasers were much more willing to provide a rating, but were an rather unsatisfied bunch. First, I think that the results of this experiment suggest some very positive trends about App store users that will help developers price their apps. When I look at the download data, I get the impression that the major hurdle to overcome is simply if a user is willing to pay for an app. Once they have the mindset that they will part with some cash to buy an app they want, the actual price doesn't matter. If they want the app, then there isn't really a difference between $0.99 and $2.99. I am basing this on the fact that decreasing the price did not significantly improve the number of downloads. There might be more price resistance at $4.99 and above, but I'm not willing to try it. Second, I believe there might be some marketing "mojo" built-in to pricing an app above the $0.99 threshold. Maybe the user expectations for $0.99 apps have been lowered to the point where they simply expect the app to be (cr)apps and fulfill their own expectations. Users who downloaded at the $2.99 price point are more vested and have rated and reviewed the app very well and have contacted us in regard to support and feedback issues. I have not received a single support request from any user who downloaded during the week. This experiment has confirmed our initial pricing strategy. It appears that our customers do value the features we've built in to the apps and are willing to pay a premium for them. Are we leaving 'money on the table' by continuing to price the app at $2.99? I hope not, but I don't think so. Users of our app no doubtably have downloaded all of the free baby naming apps and realize there is a reason they are all free. Once they have overcome the psychological barrier of deciding to pay for an app, they are more prone to actually evaluate the feature set of each app and choose the best one for them. As one of the reviewers of Stork Drop wrote, "you get what you pay for...on the App Store this is especially true." It looks like there is no marketing/pricing strategy for small developers that will ever equate with word-of-mouth popularity or being featured by the App Store. Until then, BabyBinks will just have to have patience. And by the way, Patience is a girls name that means...patience.